Clay brick has been a standard building material for thousands of years, used both for building walls and as paving surfaces for roads, pathways, and courtyards. Although in modern usage, cobblestones and concrete pavers are somewhat harder and more durable than clay brick, classic brick can still easily stand up to normal driveway usage provided they are laid over a good base and maintained regularly. Brick pavers are a manufactured product made of clay that is cast in forms, then heat cured, usually in the shape of a rectangle. Cobblestones, on the other hand, are a natural stone cut into paver shapes; concrete pavers are cast bricks made of Portland cement and aggregate. In contrast to clay wall brick, paver bricks are solid, smooth-surfaced clay without holes or gaps. Most paver brick is clay-colored and rectangular, but other shapes and colors are now available. Depending on your choice, you can create a driveway that looks like it's been around for 100 years or one that fits right in with modern house and landscape designs. Brick pavers can be set in a base of either sand or mortar. As with any driveway material, the key to a good brick paver driveway is a well-prepared base. Remove the soil (or the existing driveway) to a depth of at least 12 inches. Make sure the surface is graded to encourage water to run away from the garage. Compact the soil, then add 8 to 12 inches of gravel. Compact the gravel, then add a 1 1/2-inch layer of sand. Level the sand with a long 2 by 4 or the back edge of a rake. Do not skimp on the base preparation. Without a solid, well-compacted base, the weight of vehicles on your driveway may ruin the surface if the base is not adequate. When the base is ready, start laying bricks in a pattern you like. Bricks can be cut individually, but it can be much quicker to trim the edges all at once with a handheld cut-off saw or rental table saw. When that's done, plan to set the perimeter bricks in concrete, even if the rest of the driveway is set only in sand. This will help keep the driveway bricks from falling away along the edges. You might also want to use a different material, such as stones or concrete pavers, along the edges to provide a border contrast. Another option is to set the border bricks on their sides rather than flat to clearly outline the driveway. Finally, begin sweeping sand into the joints between bricks. Compact the surface, add more sand, and compact again. You should be able to buy the materials needed for a brick paver driveway for about $5 per square foot. If you plan to do the job yourself, the labor will be free. A professional installation will probably start at about $10 per square foot, although fancier designs and pricier bricks can drive that price higher. Clay pavers will gradually weather over time under the influence of moisture and ultraviolet rays from the sun. Proper maintenance can greatly extend the life of your driveway to 25 years or more. A brick paver driveway should be washed once or twice a year with a pressure washer. Make sure to remove weeds and dirt from between bricks. After the surface dries for a day or two, pack the joints with fresh sand if it is a loose-fit surface. If the pavers are mortared, repair any cracks with fresh mortar and let dry fully. 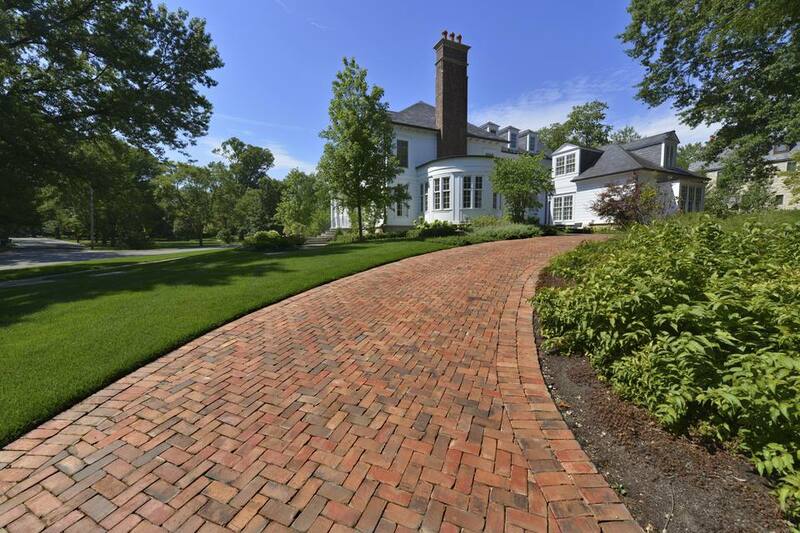 When sealing a paver driveway, use a product designed for clay brick, such as a silixane-based sealer, which will protect without changing the appearance of the brick. Avoid gloss-finish sealers, which often result in a splotchy surface. There are, however, "wet look" sealers that look shiny without actually producing a gloss. To ensure a long life, the bricks should be sealed after each washing. If left unsealed, clay brick can begin to flake and peel over time. A properly installed brick paver driveway should last at least 25 years, and perhaps longer in a dry, moderate climate. A sealer can be applied with a good pump sprayer or can be rolled or brushed over the surface. Seal the sand joints as well as the surface of the brick, as this will help solidify the sand and prevent weeds and moss from appearing in the joints.